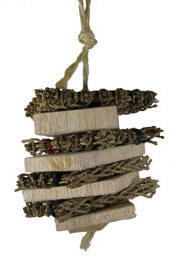 Sea grass and balsa slabs (3" x 3" x .5") ... strung on paper rope! The Balsa Sandwich is sure to put a smile on your balsa loving parrot's beak! This is a fun, shredable toy for those Busy Beaks in your house that enjoy soft, chewable balsa! If your parrot loves balsa ... check out this page!